Nanomaterials are so small in size that at least one of their dimensions is below 100 nanometers (nm). To get an idea of what that means, you have to keep in mind that a human hair, for example, is about 80,000 nm wide. Even though nanomaterials are small size, their special properties make them highly interesting for economy and sciences. Especially in industry and research, nanomaterials are in demand like never before. We at PlasmaChem want to contribute to increased integration of nanomaterials in the daily routines in factories and laboratories. Because nanomaterials have the potential to bring progress that is comparable to that of a quantum leap. Comparable to many other cases, some nanomaterials also occur in nature and can serve as a model for the synthetic nanomaterials that we work with nowadays. 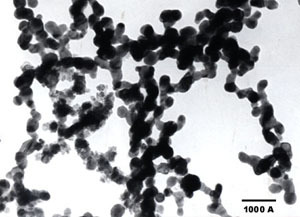 For instance, the fine dust released during a volcanic eruption is full of nanomaterials. In principle, silk consists of nanomaterials, too, and so do the wax crystals on the top surface of a lotus leaf. The scales on a butterfly’s wings are another example for nanomaterials, and so are red blood cells. What makes these nanomaterials so special is that, due to their small size, they have different physico-chemical properties compared to larger particles of the same chemical composition. 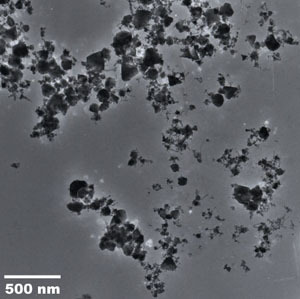 The main reason is that particles the size of nanomaterials have, in essence, a substantially enlarged particle surface compared to a product consisting of larger particles. This results in a considerably increased chemical reactivity and biological activity, altered mechanical and electrical properties, and, in addition a strong catalytic behavior. What are the benefits of nanomaterials in plain text? Nanomaterials are now in use in many areas. As flow aids and preservatives in foodstuff, light converters in displays and lamps, mechanical enforcement additives in composites, transparent conductive coatings in electronics, and hundreds of other applications. Furthermore, the cosmetic industry uses nanomaterials frequently because of their ability to influence positively the visual effects of cosmetic products. Yet another example are vitamines such as coenzyme Q10. 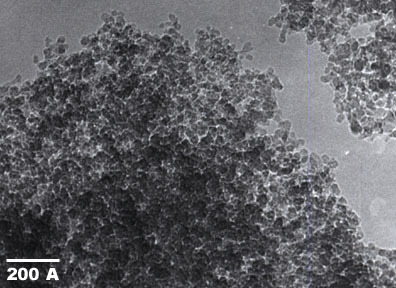 This water-insoluble enzyme becomes water-soluble upon encapsulation in or mixing with some nanomaterials. Until recently, the current practice was to break down any material one wanted to use in order to release the nanomaterial before re-using it in the final product. Today, many nanomaterials are built synthetically and then inserted into the product. In this way, the production has become much more effective and targeted, especially because nanomaterials can be designed so that they best fulfill their purpose. 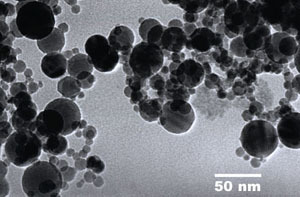 In 2011, an estimated 11 million tons of nanoparticles were consumed worldwide as part of the economic use in products and production methods. Tendency increasing. A clear indication of the progress that these tiny materials bring to many areas of the market, economy, technology and research. We at PlasmaChem have set us the goal to make nanotechnology for the broad markets as safe and appealing as for research. This includes our own research projects in the field of nanomaterials, but also the open and trust-based trade of these products with the existing markets, and the creation of new markets. So that the smallest materials can continue to contribute to the greatest progress. Metal cluster size can be regulated with step 10 nm in range 10-300 nm. Narrow size distribution of spheric particles. Give fine nanoprofiles at sintering.